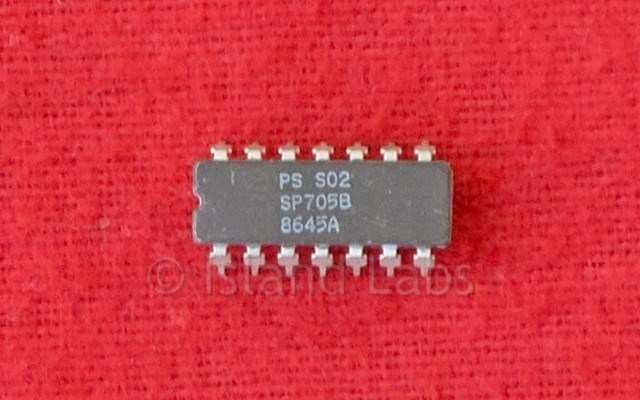 The SP705B, made by Plessey, is a square wave oscillator circuit designed to operate in conjunction with an AT-cut quartz crystal of effective series resistance less than 300 ohms. Four TTL outputs are provided, related in frequency to the crystal frequency f as follows: f/2, f/4, f/2 and f/4. The SP705B is therefore ideally suited to either single or multi-phase TTL clock applications. The crystal maintaining circuit consists of an emitter-coupled oscillator, with the emitter resistors replaced by constant-current generators. The crystal is connected, usually in series with 20pF capacitor, between pins 5 and 6. The 20pF capacitor can be replaced with a mechanical trimmer to allow small changes in frequency to be made, as shown in Fig. 62. 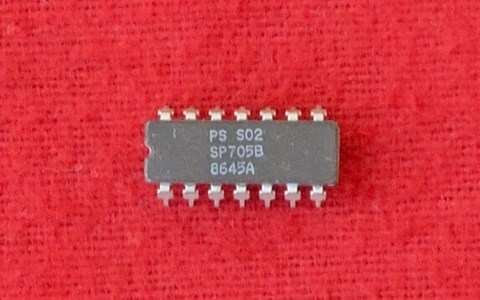 The circuit is designed to provide low crystal drive levels —typically, less than 0.15mW at 5MHz. This is well within crystal manufactures' limit of 0.5mW. The compensation point, pin 4, is made available so that the compensation capacitance can be increased if necessary. However the 14pF capacitor included on the chip is usually sufficient to prevent spurious oscillation at high frequencies.